Not to be confused with Feckenham. 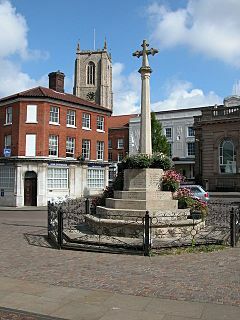 Fakenham is a market town and civil parish in Norfolk, England. It is situated on the River Wensum, some 19 mi (31 km) north east of King's Lynn, 19 mi (31 km) south west of Cromer, and 25 mi (40 km) north west of Norwich. The civil parish has an area of 3.49 sq mi (9.0 km2) and in the 2001 census had a population of 7,357 in 3,292 households, the population increasing to 7,617 at the 2011 census. For the purposes of local government, the parish falls within the district of North Norfolk. The name Fakenham is Saxon, possibly meaning Fair Place/Place on a Fair River, or Hamlet (Ham) on the river (Ken) Fa/Fair (Fa). Its major industry in the 19th and 20th centuries was printing, but the major printworks (Cox and Wyman) closed in the 1970s. Nevertheless, there are still more than ten small printing firms in industrial premises around and near the town. A large number of printing blocks have been set into the surface of the market place as a memorial to this lost industry. In the late 1990s the town was listed by contributor Robert Woods to The Knowhere Guide as "the most boring place on Earth". The contribution was specifically referring to Wednesday afternoon which is 'early closing' day in Fakenham. This comment, made by Woods, was taken and quoted out of context as 'voted' the most boring place on Earth" and very rapidly the story was running in national newspapers with the town council defending the town and spending considerable time, money and effort trying to prove that this was not the case. Fakenham was recently voted the seventh best place to live in Britain in Country Life's quality of life survey. Recent investment in Fakenham has seen the town centre being renovated and pedestrianised. It now enjoys a popular farmers' market on the morning of the 4th Saturday of each month. Fakenham is now the home of Kinnertons Chocolate employing some 700 people. Established in 1978, Kinnerton Confectionery is now Britain's largest manufacturer of chocolate and novelty confectionery specialising in character licensing. The town was the base for North Norfolk's first independent commercial radio station, FTR FM, broadcasting for a short period between 4 and 30 August 1997, using an RSL broadcast licence. Other RSL radio stations followed, between November 1998 and May 2001, including FCR 107.2 and Central Norfolk Radio. On 25 May 2014 the historical Aldiss building, which had been a feature of Fakenham town centre for many decades, was destroyed by fire. The building was at the time host to the Original Factory shop, after the Aldiss outlet had been moved in the 1990s. There is a currently a petition circulating around the local area for the site to be cleared and remain free of new building work, due to the scenic view of the local church now visible from the town square. Fakenham Parish Church was built in the 14th Century and replaced an earlier Saxon Church. Attractions in the town include Fakenham Racecourse and the Museum of Gas and Local History. The first school in the town was the National School for Boys which opened in 1839. The second, provided by the British School Society, was built in 1844. A National School for Girls followed in 1848. In 1913 a council school was built on Queen's Road to replace these and all the children moved there, being separated into the boys', girls' and infants' schools provided within the one complex. In 1944 the Queen's Road school was converted into a "primary and secondary modern school", but the growth of the town was putting a lot of pressure on the available space. In 1956 a new secondary modern school was built on Field Lane, opening in 1959. The town is presently served by a purpose-built infant school, a junior school on Queen's Road, and Fakenham Academy on Field Lane. 1st Fakenham Scouts were established on 3 May 1923, with their headquarters listed as being on Bridge Street. The group was re-registered on 21 October 1948 as part of the North West Norfolk District. At this time the group was meeting at the Congregational Schoolroom on Norwich Road, which is now part of an antique centre. On 1 April 1968, 1st Fakenham Scout Group, now a part of the Fakenham District, asked for permission to change their name to Fakenham Wensum Scout Group. 2nd Fakenham (Salvation Army) Scout Group were first registered on 10 February 1954, meeting in the Salvation Army Hall on Oak Street. In February 2008 the Baden-Powell Scouts opened Fakenham Lancaster Baden-Powell Air Scouts, giving the town two active Scout groups for the first time in 39 years..
Girlguiding UK has several active groups in the town. 1 Guide unit, 2 brownie units and 1 Rainbow unit. They are part of the Gallow District and the North West Norfolk Division. The town is the home of 2534 Squadron, Air Training Corps, who parade at Fakenham College. Fakenham Town Band is a thriving traditional brass band based in Fakenham. It was established in 1881 and has enjoyed continuous existence since. 'Fakenham' is the alias that the character Redmond Barry adopts after deserting his regiment and impersonating a messenger in the Stanley Kubrick film Barry Lyndon. The setting of Super Hans' wedding in the second episode of the 9th series of Peep Show. Fakenham Facts for Kids. Kiddle Encyclopedia.